Rationalist Judaism: A Mistake In Science, Or A Mistake In Torah? A Mistake In Science, Or A Mistake In Torah? Continuing our review of Rabbi Meiselman's book, I would like to draw attention to an astonishing principle that he asserts. First, though, for the benefit of those who have not read the book and are confused about his overall approach, a few words of explanation. Rabbi Meiselman's major thesis is that "if Chazal make a definitive statement, whether regarding halachah or realia, it means that they know it to be unassailable" (p. 107). But, says Rabbi Meiselman, if they make a tentative statement, it could potentially be in error. In this post, I will not deal with the difficulty of reconciling this with countless topics from the Gemara and sources from Rishonim and Acharonim that are not mentioned in Rabbi Meiselman's book. It is sufficient for now to discuss only the difficulty of reconciling this with other topics in Rabbi Meiselman's own book. Let us first consider the case in Pesachim, where it is Rabbi Yehudah HaNasi that concedes that the gentiles are correct with regard to the sun's path at night. That would initially seem to fit well with Rabbi Meiselman's principle. But let us suppose that Rabbi Yehudah HaNasi would not have conceded to the gentiles (or let us suppose that that part of the Gemara would have been lost). According to Rabbi Meiselman, it would then have been forbidden for us to say that the sun goes on the other side of the world at night! Rabbi Meiselman does not even seem to observe his own methodology with other cases that he discusses later in the book. For example, with regard to the mouse that is generated from dirt, Rabbi Meiselman says that Chazal were not definitively stating that it exists, only tentatively exploring the possibility. It is therefore, he says, not problematic to point out that there is no such creature. But Chazal never said that Chazal were wrong! Isn't he contravening his own methodology, quoted above? Is he not being melagleg al divrei Chachamim by his own definition? This is remarkable! Remember how the Gedolim came crashing down upon me for saying that Chazal made errors in science, due to their following the scientists of their era? Isn't it much, much worse to say that Chazal were actually making errors in Torah rather than in science?! Furthermore, how can this be reconciled with what Rabbi Meiselman writes elsewhere in the book? The most obvious example of Rabbi Meiselman's principle is the case in Pesachim. So, Rabbi Meiselman is telling us, the Sages who believed that the sun goes behind the sky at night were not following the contemporary Babylonian cosmology; instead, they were solely, albeit tentatively, deriving their position from the Torah. It is extremely difficult to reconcile this with what Rabbi Meiselman writes in the chapter about Pesachim, where he is arguing that the Sages of Israel were wrong precisely because they could not obtain their knowledge from the Torah (and to which I responded that elsewhere in the Gemara, we see that they did relate their cosmological view to Scriptural exegesis). Those of us who follow the rationalist Rishonim and Acharonim, and who do not subscribe to Rabbi Meiselman's assertion that only Chazal can point to errors in Chazal's statements, will observe a remarkable phenomenon. There are numerous cases where Chazal's statements about the natural world are incorrect, whether they are referring to salamanders spontaneously generating from fire, seven-month fetuses being more viable than eight-month fetuses, the kidneys providing counsel, hyenas changing gender, etc. According to Rabbi Meiselman, we are not allowed to declare any of these to be mistaken; and even if they were mistaken, they were mistakes in the Sages' interpretation of Torah - they were not presentations of the mistaken science of their era and had no connection to it. But where does the Torah speak about salamanders coming from fire or hyenas changing gender? And isn't it an extraordinary coincidence that those insights which turn out to be in error are so often identical to the errors made by non-Jewish scientists of that era? Regarding your penultimate paragraph ("Furthermore..."), I think I remember reading that Rabbi Meiselman considers the Pesachim 94b case to be exceptional. So perhaps he believes that in that case, and that case only, Chazal, having lost their masorah, were basing themselves on science alone rather than Torah. Maybe what Rabbi Meiselman means is that on Pesachim 94b the Sages had lost their masorah about that astronomical issue, and so they were forced to resort to trying to derive the answer from the Torah using the middot shehatorah nidreshet bahen. Had they still had an actual masorah misinai about that topic, they could not possibly have been wrong. I am at the decided disadvantage of never having seen, let alone read, Rabbi Meiselman's book. I am just trying to reconstruct it, and what he must be thinking, from your posts. Consequently, even when a tentative statement of Chazal is in error, it is not an error in science but an error in the interpretation of the Torah. Wasn't one of the bans against you based on something like the following "If Chazal could be wrong in science, then they could be, God forbid, wrong on the Torah as well"? I seem to remember such a sentence, but I can't find it now. Rambam says in his introduction to Perek Chelek that all of the aggadic portions are allegorical. I would like to suggest a compromise position. When Chazal decided to use scientific metaphors they chose the scientific theories of their times. This was necessary so that their statements would be understood properly and accepted. Whether they actually believed them, or even if they cared, was irrelevant. "(R' Meiselman)... is arguing that the Sages of Israel were wrong precisely because they could not obtain their knowledge from the Torah (and to which I responded that elsewhere in the Gemara, we see that they did relate their cosmological view to Scriptural exegesis)." Just be careful not to equate "obtain" (or derive) with "relate." Avi, they weren't always using "metaphors." Sometimes, they were talking straight science. Rambam is talking about a particular class of aggadic material, which does not cover Chazal's scientific statements. Its quite unfortunate that the most practical applications in the talmud turn out to be merely presentations of contemporary science and wrong. Is the justification for this caveat dealt with in his book? 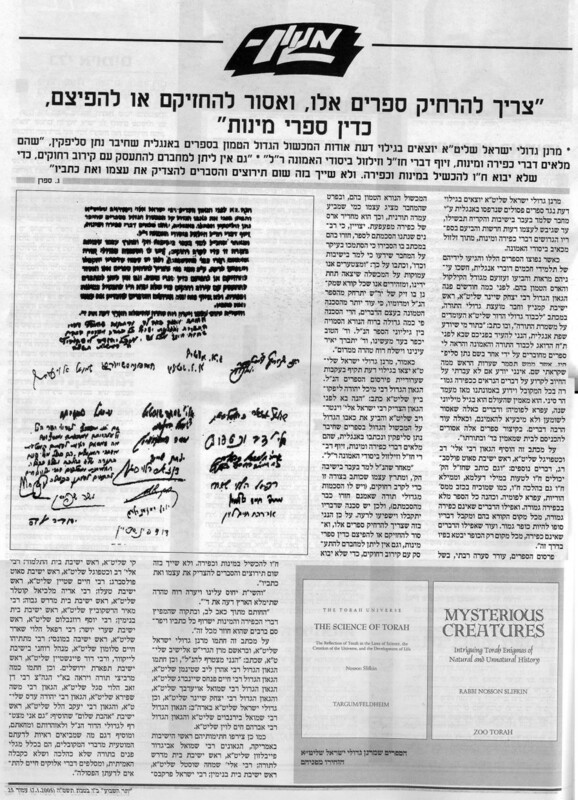 "Rambam says in his introduction to Perek Chelek that all of the aggadic portions are allegorical"
The story of the dispute between the Chachmei Yisrael and Umos HaOlam is not a derasha but a story (Aggadeta vs. Midrash Aggada). And it is not clear that even these should be conflated. A while back someone said the story of Rabba asking both young Abaye and young Rava where Hashem is (one pointing to the ceiling, the other pointing to the sky) was allegorical, thus conflating the two. Because it was a story, and thus aggada, and Rambam says aggada is all allegorical. But even regarding regular midrash aggadah, I can think of many that are quite plausible as happening, not involving impossibilities of the same sort. E.g. that Yaakov was cooking lentils because this was right after Avraham died. Not everything must be allegorical, even according to Rambam. At least, that is my read of it. "Let us first consider the case in Pesachim, where it is Rabbi Yehudah HaNasi that concedes that the gentiles are correct with regard to the sun's path at night. That would initially seem to fit well with Rabbi Meiselman's principle. But let us suppose that Rabbi Yehudah HaNasi would not have conceded to the gentiles (or let us suppose that that part of the Gemara would have been lost). According to Rabbi Meiselman, it would then have been forbidden for us to say that the sun goes on the other side of the world at night!" You are misrepresenting Rabbi Meiselman's approach. The idea is that: (1) All knowledge nature is, in principle, contained in the Torah. (2) Chazal's level of mastery of the Torah enabled them to derive SOME of this knowledge with certainty. (3) Chazal would not have presented descriptions of nature in a definitive manner unless they were certain that they had correctly derived them from the Torah. Thus: (1) The fact that Rabbi Yehudah HaNasi agreed with the Chachmei Ha'umos was not mere good luck- it was because he did not succeed in finding a clear Torah proof to the contrary. If he had, he certainly wouldn't have favored the position of the Chachmei Ha'umos over that of the Torah. (2) The fact that the Gemara records this event is also not just good luck. This is how the Gemara informed us of the non-definitive nature of this opinion. Had the debate not taken place, the Gemara would have indicated in some other way that the opinion of the Chachmei Yisroel was not definitive, or perhaps they would not have included it in the Gemara at all. 1) But, acc. to R. Meiselman, ALL of Chazal's opinions, no matter how tentative, were based their understanding of Torah. Why would they respect gentile opinions which were not based on Torah? 2) You misunderstood what I was saying. Suppose that the last few lines of Pesachim 94b had been lost over time (as has happened with parts of the Gemara), or removed by Christian censors or whatever. Acc. to R. Meiselman, it would be forbidden for us to observe that the sun goes on the other side of the world at night! > For anyone other than Chazal themselves, questioning their conclusions is called being melagleg al divrei Chachamim - "mocking of the words of the Sages" - a crime with very serious consequences." This series of posts, while very interesting, has also seemed faintly ridiculous to me, but I couldn’t put my finger on why. The above sentence illustrates the problem nicely. You and R’ Meiselman are disagreeing over whether one may say Chazal were wrong. But why? If they were wrong, then they were. The world is as it is. Labeling recognizing reality as, “a crime with very serious consequences,” is just a desperate attempt to stick his fingers in his ears and pretend he can’t hear the chorus of voices telling him that his worldview needs adjusting. Twisting what Chazal said in order to pretend that they didn’t mean what they obviously said is more of the same. Why debate the point? What difference does it make if there are traditional sources that “allow” you to say that Chazal could be mistaken? They obviously could be and were. That’s it, end of discussion. The difference is whether you can say it and remain a member of good standing in the Orthodox Jewish community. The problem with this approach should be obvious, given R' Meiselman's assertion that Chazal could be in "error in the[ir] interpretation of the Torah." Once you concede that someone can be mistaken (which, frankly, should not require much "conceding"), the fact that a fallible human is certain of their correctness on any particular thing is of no moment; if they can be in error substantively, they can be equally in error in their certainty. "For anyone other than Chazal themselves, questioning their conclusions is called being melagleg al divrei Chachamim - "mocking of the words of the Sages" - a crime with very serious consequences." This, in the end, is the heart of the problem - an inability to see that the statement "Chazal were wrong about X" is not the equivalent of "Chazal were fools about X"
"Isn't it much, much worse to say that Chazal were actually making errors in Torah rather than in science?!" Not necessarily. I think the assumption that R' Meiselman (and others like him) makes is that deriving scientific insights directly from the Torah is an extremely difficult task that only those with the greatest skill and piety can accomplish, and even then only with great difficulty and mixed results. For example, an unstated assumption in the (apocryphal) story of the Chazon Ish deriving knowledge of brain surgery from talmud torah is that it takes someone at the level of a Chazon Ish pull it off. To amei haaretz like you or me, it sounds ludicrous and impossible to learn out brain surgery from learning Torah. Compared to the sublime and elevated art of deriving scientific knowledge from talmud torah, arriving at scientific knowledge merely from observing the world, reading scientific literature and possibly doing experiments is a simple and base pursuit that even the goyim can do. Therefore, it's much less of a dishonor to say that an Amora or a Tanna made a mistake in the extremely difficult task of learning out scientific facts from Torah than to say that they made a mistake in the relatively easy task of learning out scientific facts from studying science. I hear what you're saying, but I bet Rav Elya Ber Wachtfogel wouldn't see it that way! Or at the least it's an approach of plausible deniability--claim to say that Chazal were right, while disagreeing with them (or even also explicitly saying that they were not right). Many examples of this approach may be found in the transcripts presented in R.D. Laing's "Sanity, Madness and the Family." I think it goes beyond this. The problem with imputing super-powers to Chazal is that it translates into diminished respect for contemporary leaders as well, since they don't 'measure up' to the unrealistic portrayals of the people of the past. I'm not disputing the various notions of נתקטנו הדורות, just suggesting that it is painfully over-utilized. Unbeknownst to him, Rabbi Meiselman is on the way toward Rationalist Judaism. He just needs to take the final step and realize that ALL of the scientific statements in the Gemara were made "tentatively". IOW,Chazal themselves did not mean to lend the authority of Torah to their scientific statements. "He also writes that the holy Chazal were capable of error, God forbid, in ordinary matters and implying, God forbid, also in matters of Halacha, God forbid, as he "proves" in a deceptive manner from Tractate Horioth, dust to his mouth". This sounds like the mirror image of your description of R. Meiselman's position. I posted this earlier, but it didn't go through. See what I wrote in the comment section here. I am not sure that Rambam is saying there all aggadah. In context, he is addressing the utterly impossible aggadah which, if taken literally, would make Chazal look foolish. And he refers to the aggada in perek chelek and in brachot in particular. Think of midrashim about the moon talking, or Hashem taking human form and shaving Sancheriv. Also, one should not conflate aggadeta and midrash aggada. Which is Rambam talking about. Does he indeed say that every story involving Tannaim and Amoraim is allegorical, such that only a fool from the first group would think that e.g. Mar Zutra Chasida suspected a person of theft based on their maltreatment of someone's garment? I usually point this out to 'rationalists' who are a bit too eager to label every midrash which makes them uncomfortable as clearly intended allegorically. "1) But, acc. to R. Meiselman, ALL of Chazal's opinions, no matter how tentative, were based their understanding of Torah. Why would they respect gentile opinions which were not based on Torah?" He was not favoring their opinion over Torah opinion. He was rejecting a tentative understanding of Torah based on observational evidence. "2) You misunderstood what I was saying. Suppose that the last few lines of Pesachim 94b had been lost over time (as has happened with parts of the Gemara), or removed by Christian censors or whatever. Acc. to R. Meiselman, it would be forbidden for us to observe that the sun goes on the other side of the world at night!" All you're doing is highlighting even more contradictions in R. Meiselman's book. He doesn't say that it's okay to disagree with Chazal if the evidence seems clear to us. And by the way, R. Yehudah HaNasi's reason for agreeing with the Gentiles over the Torah-view of the Sages was wrong! The sun does not heat up the wellsprings at night! And he refers to the aggada in perek chelek and in brachot in particular. I agree that he is not necessarily saying that all are allegorical and he particularly points out the ones that make Chazal seem foolish. But I think that if you look at his purpose in the introduction to Chelek, he is justifying his version of Alom Haba which doesn't match up exactly with Chelek. If you read Chelek, you definitely get the impression that T'chias HaMeisim and Olam Haba are closely tied to one another. This is one of the positions that the Rambam says is prevalent, but that he rejects. I think that the Rambam is, in part, justifying his deviation from that "plain p'shat" of Chelek, despite the fact that much of what is written the is not "fanstatic" in nature. Otherwise, the placement of that section where it is, is quite odd. Also, I'm not going to find the quote now due to time constraints, but he says that speaking in allegory is a positive technique used by wise people. So he seems to endorse looking for allegory for it's own sake, not just to avoid what seems on the surface to be foolish. What is ironic is that the "non-rationalists" are using that Rambam to refer to all statements about science, while the "rationalists" are seeking to limit the principle to a smaller range of statements. > The difference is whether you can say it and remain a member of good standing in the Orthodox Jewish community. How much does that matter? To paraphrase your objection to R’ Meiselman’s position, suppose that there were no Rishonim who said that Chazal erred. Would that mean that to be an OJ you had to accept that the sun went behind the firmament? If so, why would you want to be an OJ? Either you can be an OJ who accepts reality, with or without “permission” from previous generations, or you can insist that one can only believe what is allowed, reality be damned. If you accept the latter position, than you are no different than R’ Meiselman. You just disagree about what the acceptable beliefs are. You’re arguing over how many angels can dance on the head on a pin. But I have gotten the impression that you take the former position, and finding rishonim who agree is just a way of making it kosher for those who take the second view. In which case there is some value in refuting R’ Meiselman, but there would be greater value in getting people to recognize that reality won’t go away just because it contradicts something Chazal said thousands of years ago. I agree with your sentiment, G*3, with one exception. The struggle, it seems to me, is over the definition of OJ and who controls that definition. I, for one, do not want to give up on OJ just because it has been (temporarily, I hope) hijacked by a historically false and irrational wing of the movement. Leaving the field to them is not an option anymore than leaving one’s country is an option for many when a despicable government takes power. Some things are worth fighting for. Maybe someone else extends this idea to scientific claims as well . . .
"And by the way, R. Yehudah HaNasi's reason for agreeing with the Gentiles over the Torah-view of the Sages was wrong! The sun does not heat up the wellsprings at night!" chachamim mevateled that setup and made it look like it was wrong as a test of our emunos. Question to you : does this (IMHO correct) thought extend to other “required” OJ beliefs??? What "Naar Ivri" left out was that what we would be forced to do according to Rabbi Meiselman is interpret the statement of Chazal in such a way as to avoid a contradiction with clear, observable facts. "Rabbi Meiselman does not even seem to observe his own methodology with other cases that he discusses later in the book. For example, with regard to the mouse that is generated from dirt, Rabbi Meiselman says that Chazal were not definitively stating that it exists, only tentatively exploring the possibility. It is therefore, he says, not problematic to point out that there is no such creature. But Chazal never said that Chazal were wrong! Isn't he contravening his own methodology, quoted above? Is he not being melagleg al divrei Chachamim by his own definition? Can any Slifkin supporter reading this thread spot the faulty logic here in Rabbi Slifkin's attack? Well, he does cite a Rashba who quotes two gemaras which say exactly that and extends it to other statements about the natural world like what is a fatal condition. That certainly proves that this is what the Rashba held. Sorry for the rash of comments back-to-back, but I'm in a rush. The struggle, it seems to me, is over the definition of OJ and who controls that definition. I, for one, do not want to give up on OJ just because it has been (temporarily, I hope) hijacked by a historically false and irrational wing of the movement. Leaving the field to them is not an option anymore than leaving one’s country is an option for many when a despicable government takes power. Ultimately, there is little recourse when an irrational mega-fundamentalist leadership takes over a religious sect that even in its "modern" or liberal incarnations is, at its heart, fundamentalist. "Questioning rabbis = mocking them"
Those are Meiselman's exact words (substituting rabbis for chazal.) And that is really all you need to know to reject his position, flatly and finally. Wow! Saying that the rabbis erred on biblical interpretation is a big no no. Perhaps they erred on halachic drashos as well? Very problematic. Although, I assume RM would say that in halacha they have Siyata dishmaya or that the heavens bend to their interpretations. > Question to you : does this (IMHO correct) thought extend to other “required” OJ beliefs??? I think the whole notion of “required beliefs” is ridiculous. Go outside on a clear day, look up, and try to convince yourself that the sky is green. I could accept the idea of required beliefs as descriptive rather than proscriptive. That is, the definition of an Orthodox Jew is someone who holds of X,Y, and Z, so you are required to believe those things in order to be defined as an OJ. Required beliefs cannot be things that you are morally required to believe are true, because people cannot make themselves believe that something they know is false is true. "The problem with imputing super-powers to Chazal is that it translates into diminished respect for contemporary leaders as well, since they don't 'measure up' to the unrealistic portrayals of the people of the past." as having some smidgen of their greatness rub off on him; while whoever is disconnected from chazal, (working with ירידת הדורות), is 'rubbed' only our by lowly דור. "seven-month fetuses being more viable than eight-month fetuses,"
I still don't understand your insistence on reading the Talmud this way. If someone believes they are giving birth in the 7th month, odds are that they started counting late, perhaps the woman naturally has an irregular cycle. I also see people talking about a fluid that enters the lungs at 8th months, but I can't find any collaborating evidence for that. "If the world was flat (as it was in those days ) it (the sun ) would heat up the earth"
This is a myth. Nobody thought the world was flat, until someone decided to besmirch Christians in the 1800s. You are wrong. The myth is about medieval beliefs in Europe. In ancient Babylonia, people did indeed believe that the world is flat. What do you mean by ancient babylonia? The Talmud was written between the 4th and 8th century. Almost 500 years after the world was known to be round in that region. The talmud Yerushalmi in Avoda Zarah is very clear, when it describes the world as a ball. It was known to be round by the Greeks, not by everyone. See the sources cited in my monograph. If you wanted an example of an intelligent person capable of accurate observation of phenomena but who wound up drawing spectacularly wrong conclusions you couldn't do much better than R.D. Laing. Adapted from Wikipedia: Canalicular period (weeks 16 to 26) The lumina of the bronchi enlarge and lung tissue becomes highly vascularized during the canalicular period. By week 24, respiratory bronchioles and alveolar ducts have developed from the terminal bronchioles. Respiration is possible towards the end of this period, but few fetuses born during this time will survive. Terminal saccular period (week 26 to birth) The important blood-air barrier is established during the terminal saccular period. Specialized cells of the respiratory epithelium appear at this time, including type I alveolar cells across which gas exchange occurs, and type II alveolar cells which secrete pulmonary surfactant. This surfactant is important in reducing the surface tension at the air-alveolar surface, allowing expansion of the terminal saccules. During this time, the lungs are rock-like and will sink if placed in water but will expand after the first breath, a trait which is used to determine if babies were born alive. "The entire [inhabited] world is under (smaller than any) one star - the proof is, if a person looks at a star [and notes its direction and its angle above the horizon], wherever he goes in the world it will be in the same direction and angle." One of Aristotle's proofs of the sphericity of earth is the fact that as you travel south, the angle of the stars in the sky is different. The Yerushalmi in Avodah Zarah is unclear. The earth is described as a ball, but sitting in a "plate" of some sort. This is consistent with a flat or bowl-shaped earth, with the land somewhat rounded as it rises out of the sea. "R' Yonah said: When Alexander the Macedonian wanted to go back, he flew [on the back of an eagle] higher and higher until he saw the earth as a ball and the sea as a plate." The world was shown to be round in the 4th century BC. Certainly some (or many?) of "Chazal" over time would probably have though the earth to be round, but many seem to have though otherwise. I hadn't realized you were more interested in trying to make Chazal be the backwater members of the world community, than understanding scientific knowledge during the time that the Talmud was written. As Hellenism spread around, belief in a flat earth declined. Yes, there are individuals who spoke poorly of "greek wisdom", but in general, those who were involved in astronomy knew that the world was like a ball, and not, like a coin, or a bowl. If they wanted to say that the world was like a coin, they would have said that the world is like a coin. Pesachim 94b does not only make sense if you believe the world is flat. It makes just as much sense if you believe the world is a ball, with the land, only being on one hemisphere. It seems you want to ignore the same Pseachim which says that the world is 6,000 parsangs. The same figure btw, that the greeks and Rambam give. As for your quote about the angle of the star being the exact same... That isn't what the words of the Talmud say. It makes no mention of the angle of the star, only that you can still see it. ""Rabbi Nathan said: The whole inhabited area sits under a single star. This you should know, because a man fixes his eye on a specific star and walks east--the star is before him. If he walks in any direction--it is before him. Therefore the whole inhabited area is under a single star!" As R. Slifkin already admited, by the middle ages, everybody knew the world was a globe, and yet there aren't any Rishonim who make mention of Chazal believing in a flat earth. You either have to erroneously beleive that all the Rishonim also believed in a flat earth, or just accept the fact that in the times of the Talmud, they knew the world was round, despite your deeply held beliefs to the contrary. I have no problem understanding the talmud, or picturing what they are talking about with a round earth but only 3 continents. (A earth by the way made mostly of water, and not a thin crust over a molten core) Just because you are having a hard time visualizing it, doesn't mean they did. And see Rashash Pesachim 94a where he says that Rashi and Tosafos there assume the world touches the sky i.e. it is flat. and the same can be deduced from Rashbam Bava Basra 74a where he says the sky touches the earth at the corners. You're absolutely right. But the transcripts themselves in his book are excellent examples of a local culture (in his case, a family) whose equilibrium is maintained by constant self-contradiction and confusion techniques. I see now G*3 hit upon the same point I did. Rabbi Meiselman says, explicitly, that to question a rabbi is to mock him. So why do you continue to engage him in discussion, via these posts? You can have no dialogue with someone who can believe that. You will never change his opinion or that or anyone who thinks [sic] like that, because merely by operation of asking questions you automatically invalidate yourself. That is how, you realize, people like Meiselman, ostensibly possessed of some amount of logic, are able to exist. They don't have to confront or wrestle with difficult problems, because anyone who raised a problem is an apikoris, and hence he and the problems he raises must automatically be dismissed. It's the greatest bit of circular reasoning ever invented. That, plus a general lack of curiosity, allows the Meiselman's of the word to remain blissfully unaware of any difficulties. Now as thousands of years ago, ignorance is bliss. Yasher koach! Akiva sums it up al regel achas. Best comment ever. Lawyers: is there a name for the fallacy of misconstruing "Ploni is incorrect" into the "Ploni is a fool?" The political implication of R' Meiselman's assertion is frightening. He should be asked: Who has committed this crime, by whom should they be prosecuted and judged, and with what serious consequences? Rabbi Meiselman is actually basing himself on a Gemara which SEEMS to say that someone who disbelieves a *drasha* is meleglel al divrei chachamim. See my essay "Messianic Wonders and Skeptical Rationalists." Thank you Rabbi Slifkin for acknowledging that Rabbi Meiselman is basing his views on the sources. Can we have now have an admission that he also based his view about Chazal being infallible regarding certain statements about the natural world on the Rashba and the two gemaras he invokes? And I see no one has yet picked up my challenge to find the flaw in in the main post about the mud-mouse. so I'll provide it for you. Had Rabbi Meiselman first conceded that Chazal testified that the creature truly existed, and then said that based on our own observations we must conclude that they don't exist, this would be in violation of his own principle. "Rabbi Meiselman says that Chazal were not definitively stating that it exists, only tentatively exploring the possibility." So Rabbi Meiselman eliminated the problem of the mud-mouse by asserting that Chazal themselves were never convinced of its existence in the first place. There is no issue of questioning of Chazal's beliefs about the world involved when Chazal never truly had this belief! Purporting to base a view on something is not the same as actually basing a view on something. Even if it were true (which it isn't) that Chazal never believed in the existence of the mud mouse, it is still a problem for Rabbi Meiselman. 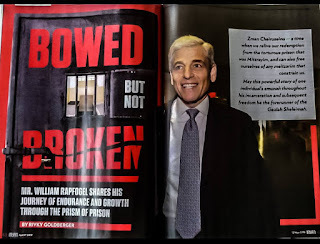 According to Rabbi Meiselman on page 108, even tentative statements of Chazal are based on their understanding of Torah, and we are not entitled to declare ANY of their teachings mistaken. And I'm sure you're the most objective person around to make that judgment! But whatever. It's your blog. In the case of the mud mouse, Rabbi Meiselman claims Chazal never taught, even tentatively, that the mouse existed. They treated it's purported existence as a device to explore the hypothetical ramifications of such a creature's tumah status. I think you're trying too hard to find inconsistency in this case.
" the gentile scholars believed that the sun continues its path to pass on the far side of the world (which we now know to be correct)"
While I understand when you say the gentile scientist were "correct" you mean that they had arrived at a conclusion by way of observation that even until today is how lay people relate to the sun in as much as we still talk about the sun rising and setting. However, as you know, they were still fundamentally wrong. The sun does not revolve around the earth sun at all and even the earth's rotation around the sun is not what gives us day and night. Both views presented in the Talmud are completely wrong. Neither the original view of the Sages, or the accepted view of the gentile scientists is even remotely correct. They had no concept of a rotating earth. Why do I feel this distinction is important? Because even according to the gentile scientist, the sun didn't shine on earth per se at night. It may have shined on some sort of underbelly of the earth, but not "the land" proper. It still could comport with the literal Creation description of the Sun ruling during the day, i.e. shining on the land during daylight hours and not at night. Today we know there is no fixed day and night for the world. It's always day and night simultaneously at any given time somewhere on earth. Today, we are forced to say the Torah presents only a limited view of the world by framing its message according to the understanding of the common man of the day. i.e. The Torah does NOT teach science. If the Torah was not presenting a scientific description but a commoner's view, then how could Chazal have learned all their science from the Torah? If the Torah can be wrong about the technical details of science - why give more credit to the Talmudic Sages than the Torah itself? Ameteur, you seem to have gone a bit wobbly on me here. I was merely trying to explain the beliefs of Chazal based on what they actually wrote. You are trying to guess what they believed based on what you think that they should have believed given their time and circumstances. Why guess when you can check? I don't disagree, what does that have to do with anything? I'm trying to understand the opinions brought down in the Gemara. OK, not sure where you going with this. I said Pesachim 94a, not 94b. Although having the Sun go back behind the sky implies a flat earth (or a somehow one-sided earth). Also, the notion that this happens, whether with a flat earth or not, was something that contemporary astronomers would have found very odd. The Sun rises and sets with the background stars + an approximately 1 degree daily motion against that background. Having the sun suddenly speed up and zoom forward over 360 degrees overnightovernight would not really fit very well. The greeks gave their measures in stadia, not parasangs. But I'm not sure where you are going with this. In any case, in Pesachim 94a, the Gemara *refutes* the notion that the world is 6000 parasangs based on some measurements using flat earth assumptions. In part, the Gemara proves that earth is actually equivalent in size to all the stars of the sky. This makes no sense with a round earth which is much smaller, yet is "under" all the stars due to the curvature of the earth. The word "angle" is not there, but his reasoning makes no sense if that is not what he meant. I can't prove that my front yard is entirely under a tree based on the fact that I can see the tree from all spots on the yard. And the rest of the reasoning makes no sense without a flat earth. R. Slifkin pointed out already that this is incorrect. But I'm not sure what you are trying to prove from this. Chazal were conservative in many ways and attempted to learn science from tradition. If at some point, there was a certain conception of the world, then that conception might have carried forward past its prime, even if the information arrived to a particular time and place. I'm not basing myself on "deeply held beliefs". I'm simply translating the words of Chazal. Diodorus of Tarsus (d. 394) may have argued for a flat Earth based on scriptures; however, Diodorus' opinion on the matter is known to us only by a criticism of it by Photius. Severian, Bishop of Gabala (d. 408), wrote that the Earth is flat and the sun does not pass under it in the night, but "travels through the northern parts as if hidden by a wall". The Egyptian monk Cosmas Indicopleustes (547) in his Topographia Christiana, where the Covenant Ark was meant to represent the whole universe, argued on theological grounds that the Earth was flat, a parallelogram enclosed by four oceans. It is not unusual for science to advance unevenly through cultures over time. This has nothing to do with Pesachim 94a. Read it and weep :). BTW, let's remember that there's generally no such thing as the "opinion of Chazal". I'm 100% sure that some of Chazal believed in a spherical earth, but it appears that others did not. What of it? "This has nothing to do with Pesachim 94a. Read it and weep :)." You are correct. It has to with the totality of Chazal's view. I suggest you read more than just the small sugyot without the context or understanding of the mesechet in which they exist. >… Rabbi Meiselman is basing his views on the sources. If R’ Meiselman is claiming that Chazal were never mistaken, then he is obviously wrong. If there are sources that make the same claim, then those sources were also wrong. If your theory of the totality of Chazal's view cannot tolerate "flat earth" theories within Chazal, perhaps your theory is incorrect. Your theory should be shaped to match the facts (whether found in small or large sugyot) and not the other way around, IMO. I also question the notion of there being a "totality" of Chazal's view on science. Chazal are simply spread over too large an time and area to assume a single coherent "view". I'm going to guess, that just like it was among the Rishonim and Acharonim, there were those that were quick to assimilate the uneven progress in math and science of the ancient world, those that understood but rejected them, and those that isolated themselves from them, on purpose or by accident. I would like to see R Slifkin's response to the last post by " someone who read the book said..."
He seems to have a good point. When Is A Mesorah Not A Mesorah?